INAGUA.” By Gilbert C. Klingel. 385 pages. INAGUA, the island which gives its name to this book, is’ the outermost of the Bahamas group — an exotic, out-of-the-way place. It has remained to this day almost unspoiled by the human touch. The author, a Baltimore businessman whose chief hobby is biology, stumbled upon it-or, more correctly speaking, was cast upon it. His original objective was San Salvador, where he and a companion were to execute a scientific mission for the American Museum of Natural History. The adventures which the book describes began at Baltimore in a boat which was a replica of the yawl, Spray, in which Capt. Joshua Slocum sailed single-handed around the world in the 1890’s. 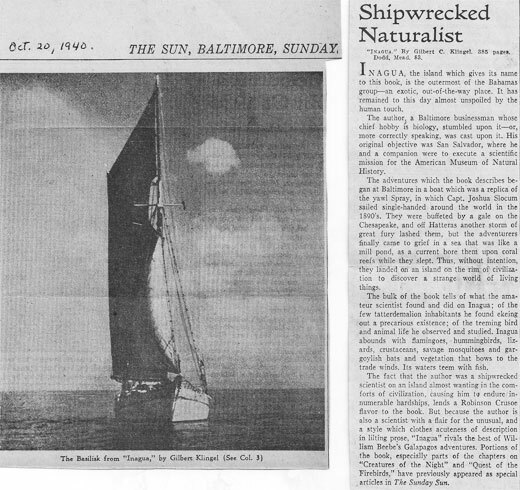 They were buffeted by a gale on the Chesapeake, and off Hatteras another storm of great fury lashed them, but the adventurers finally came to grief in a sea that was like a mill pond, as a current bore them upon coral reefs while they slept. Thus, without intention, they landed on an island on the rim of civilization to discover a strange, world of living things. The bulk of the book tells of what the amateur scientist found and did on Inagua; of the few tatterdemalion inhabitants he found ekeing out a precarious existence; of the teeming bird and animal life he observed and studied. Inagua abounds with flamingoes hummingbirds) lizards, crustaceans, savage mosquitoes and gargoylish bats and vegetation that bows to the trade winds. Its waters teem with fish. 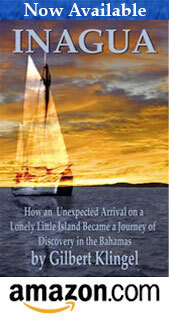 The fact that the author was a shipwrecked scientist on an island almost wanting in the comforts of civilization, causing him to endure innumerable hardships, lends a Robinson Crusoe flavor to the book, But because the author is also a scientist with a flair for the unusual, and a style which clothes acuteness of description in lilting prose, “Inagua” rivals the best of William Beebe’s Galapagos adventures. Portions of the book, especially parts of the chapters on “Creatures of the Night” and, “Quest of the Firebirds,” have previously appeared as special articles in The Sunday Sun.